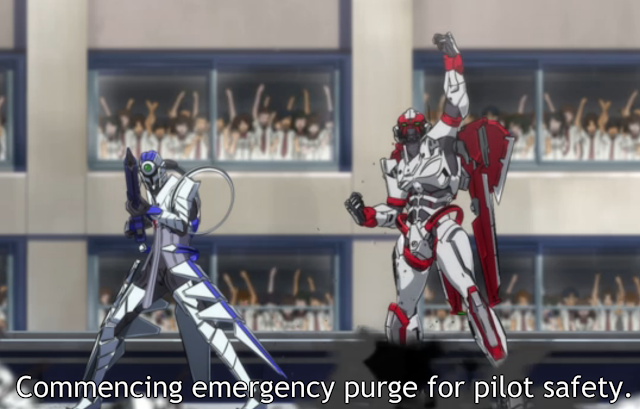 Doesn't 'purge' usually mean...oh. Oh No. Summary: Set in a futuristic Tokyo, after the Third Quicksand Disaster sinks Tokyo into a quagmire, the city's reconstruction efforts are carried out using high-output, reinforced exoskeletons called Willwears. But they can also be misused, and to combat the crimes involving them, the National Police Agency establishes at its Kichioji Branch the Special Public Security Fifth Division Third Mobile Assault, Eighth Unit, A.K.A. : Unit 8. Active Raid tells the story of “The Eighth,” a rash and careless unit of power-armored police. First Impression: This is really good. My Opinion: Did someone finally manage to hammer in the nail that giant robots are impractical, on all accounts? That's two exoskeleton based series at once, now. Grant, I think Bubuki could still pull the Giant Mech card, but still, the emphasis in the first episode of both that, and this show, is on more manageable and practical (sort of), exoskeleton equipment. The story itself is also great. Well, unremarkable really, something that has been done before. But still, great, because it's a good foundation for a great plot to rise up from. Since the story is following a Police division, there's a lot of places they can go. It could just be a 'Criminal of the Week' type of show, which would be fine, or they could string an over-arching plot over it all, which would be riskier but potentially better. The characters are so far interesting. In fact, it feels like the show went out of its way to get that adjective in this first episode, deliberately displaying several exceptional quirks from the characters in rapid succession. I'm okay with that though, because they have a very large central cast on display, what with the so far displayed two, spoken of third, active suit wearing members, and then the cluster of other command and support people. They had to cover a lot of people in a short amount of time, and I think they did alright. All told, this show could become great, or it could just coast along at Nice and Interesting. I look forward to seeing. [Aside]I've had an unusual splurge of motivation all of a sudden...Three posts at once? That hasn't happened since I started my job. Must be getting back into the flow of things, either that or I just require sufficiently interesting anime to motivate me. Did I mention Erased was awesome? I'm still buzzing from it. So looking forward to that one. I will not tolerate spam, especially not on a blog that I'm merely caretaker for.